Freedom 251, just these two words have been trending everywhere for the last one day or so as the phone has been launched yesterday in Delhi, and the Freedom 251 is everywhere because it’;s the world’s cheapest smartphone. Yeah, it costs just Rs. 251 or $4 and packs a lots of features like 1GB of RAM, a 1.3GHz quad-core processor, 8GB of onboard storage. Also, it has got a 3.2MP/0.3MP camera module combo Android Lollipop out of the box. The Freedom 251 is something which will drive people crazy for sure. Many people actually didn’t even believe when I first wrote a few lines about it on social media and well, the phone was to be delivered by June 2016 after people register for the product this morning at 6 AM via their website www.freedom251.com and just relax. But, everything went wrong as the website went down even before it could start. I was actually kinda expecting such situations to arise as this is not like Xiaomi or LeTv phones or any, the specs are crazy and it costs even lesser than a 1GB 3G data pack actually. I got alerted by a friend who pined me asking whether the site is openning or not and then I checked out and saw just a blank pagething else. Immediately I switched over to IsItDownRightNow to check the status and yes, it also got confirmed that it went down even b 6 AM, approximately at 5:55 AM as some suggesting and the closest I have seen someone getting this phone (almost) is this geek. Now, let’s leave that apart, there are some serious questions about the security of the site as I just came across a screenshot where the user was able to proceed to the cart and has mentioned that the site doesn’t even has SSL encryption. Wow!! What a great job out there by the brand. 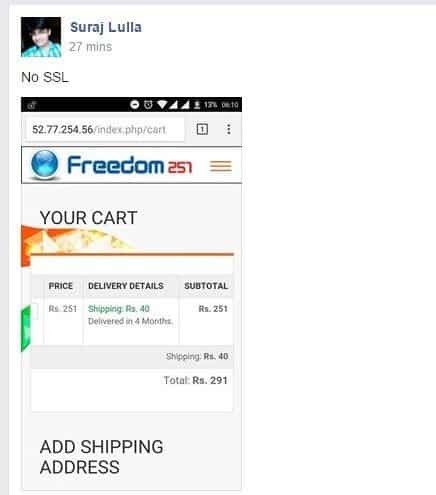 And honestly, if someone is selling a product at a kickass cheap price then probably he should know that the crowd will die for grabbing the product and should have arrangements for that, same thing applies for Freedom 251, the site is unreliable, they even overlooked security measures. Also, there ae some other news regarding the phone has it is a rebranded one, originally known as Adcom Ikon 4 which is being sold in India via Flipkart and then there should be obvious doubts regarding the pricing as the Adcom Ikon 4 costs around Rs. 4000 and has quite similar looks and specifications as Freedom 251. However, there are some differences you can spot in terms of display and camera. The website is still down, and my deepest condolences to those who had to wake up so early to grab this phone. Next articleMWC 2016 Rumor Roundup – Every Leak About Samsung Galaxy S7, LG G5, Xiaomi Mi5 and more!